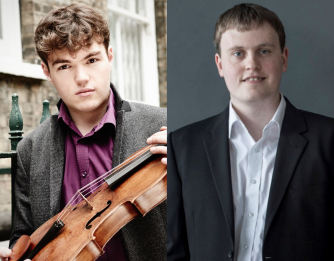 Timothy Ridout and Jâms Coleman present the first instalment of the 2018/19 Hattori Foundation Rush Hour Recital Series. Since winning 1st Prize in the Lionel Tertis International Viola Competition in 2016, Timothy Ridout has gone on to perform widely in Europe. Engagements this season include appearances as soloist with the Deutsche Staatsphilharmonie Rheinland-Pfalz, Philharmonia Orchestra, London Mozart Players, Sinfonia Cymru and Young Musicians European Orchestra (in Israel). He returns to Wigmore Hall, makes his debut in Tokyo (Musashino Hall), performs George Benjamin’s Viola, Viola at the Southbank Centre on the invitation of Tabea Zimmermann, and gives recitals at Saffron Hall, the Newbury and Kilkenny Festivals. In 2017 Champs Hill released his first CD of music by Vieuxtemps to critical acclaim. ​From Anglesey, North Wales, Jâms Coleman is a pianist who enjoys a rich and varied musical life performing as a soloist, chamber musician and vocal accompanist. He finds it inspiring and fascinating to collaborate with different musicians and values the rewards of this process. Recent highlights include performing chamber music by Colin Matthews for the BBC Proms live on Radio 3, appearing on Radio 3’s In Tune and on BBC2’s Proms Extra with cellist Jamal Aliyev, a violin and piano performance with Luke Hsu at IMS Prussia Cove, song recitals at Wigmore Hall, the Leeds and Oxford Lieder Festivals and with tenors Robert Murray (in Prague) and Andrew Kennedy, solo recitals in France and solo appearances live on S4C and BBC Radio Cymru. As a vocal accompanist, he enjoys collaborating with many singers and his engagements include recitals with such established artists as Ailish Tynan, James Gilchrist, Sir John Tomlinson, Robert Murray, Nicholas Mulroy and Andrew Kennedy. Jâms enjoyed returning to the Two Moors Festival in October where he performed the three great Schubert song cycles, Die Schöne Müllerin with Nicholas Pritchard, Winterreise with baritone Henry Neill and Schwanengesang with Nicholas Mogg. Future chamber music includes recitals with cellists Jamal Aliyev, Marcin Zdunik and Laura van der Heijden, violist Timothy Ridout, violinist Luke Hsu, piano quintets with Clio Gould and others and recording a disc of French repertoire with Luke Hsu. Jâms has appeared as a concerto soloist, performing repertoire including Beethoven’s Third, Fourth and Fifth Piano Concertos and concertos by Chopin, Brahms and Mozart. He also has experience of working as a Musical Director and repetiteur and in 2014 he conducted fifteen performances of Tchaikofsky’s Eugene Onegin across Wales. Jâms read Music at Girton College, Cambridge, where he was also a choral scholar. In 2016 he completed his Masters at the Royal Academy of Music where he studied with Professor Christopher Elton and Michael Dussek. He stayed on at the Academy as a Fellow and he enjoyed coaching and encouraging collaboration between pianists and the Vocal and Conducting departments. From 2018, he will be the Artistic Director of the concert series at St. Clement Danes in Central London. Jâms is an Oxford Lieder Young Artist, a Live Music Now Artist, a Park Lane Group Artist, a Yeoman of the Worshipful Company of Musicians and a Samling Artist. He is grateful for the support of the Countess of Munster Musical Trust, the Martin Musical Scholarship Fund, the Elizabeth Evans Trust, the John Fussell Award, the Arts Council of Wales and is grateful to the English-Speaking Union for providing funding to attend IMS Prussia Cove. While at Cambridge and the Academy Jâms studied with Professor Christopher Elton and Michael Dussek. He has also had lessons and masterclasses from pianists such as James Baillieu, Alasdair Beatson, Ian Brown, Pascal Devoyon, Julius Drake, Kirill Gerstein, Simon Lepper, Malcolm Martineau, Ferenc Rados, Kathryn Stott, Rita Wagner, and other artists such as James Boyd, András Keller, Angelika Kirchschlager, Anthony Marwood, György Pauk and Joan Rodgers. The Hattori Foundation was established as an Educational Trust by the Hattori Family and granted charity status in 1992.